Six Mile Grove plays music they love to an ever-growing audience appreciative of their organic, honest sound. You’ll catch the influences of MN music’s best - from Bob Dylan to the Jayhawks - but Six Mile Grove has also forged its own sound and space on a stage. Presented by Crossings on Sat., Sept. 7, 7:30pm, at the State Theatre. 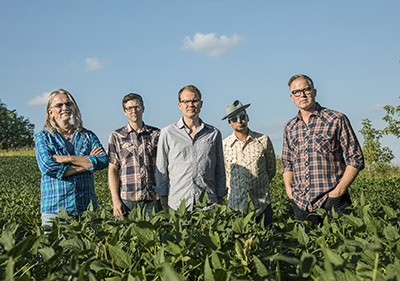 It all started when Six Mile Grove frontman Brandon Sampson injured his hand while helping his dad on the family farm in Lyle. Guitar playing was prescribed for rehab and seven year old Sampson came home with a new guitar. His younger brother Brian was given shiny new drum set to keep it fair, and the seeds of Six Mile Grove were planted. Six Mile Grove has weathered 20 years of the tumultuous music scene as a self-managed, self-produced, and self-recorded band. Its music continues to evolve, as an organic, honest voice untinkered with and untainted by the lure of record labels or flashy music producers. You will hear music from their 7th album "Million Birds," released January 26, 2019. This much anticipated album celebrates the band's 20th year together, and contemplates the humble human challenges of work, life and family. Notable songs include "Patrol Cars," co-written with singer/songwriter Matthew Ryan, the moody ballad "Shame on us," about the risks of love, and "Wage a War," a gritty Lumineer-esque song wondering about the right time to surrender, and the right time to stand and fight.